OTTO FERNANDO PÉREZ MOLINA, President of Guatemala, said that as his country’s new leader, he had set key priorities aimed at advancing stability and long-term development. First, his Government had proposed a “Zero Hunger pact”, which aimed to reduce levels of chronic malnutrition — affecting more than 40 per cent of the country’s children under the age of 5. He added that the initiative would specifically target rural areas, indigenous and farming communities. The second priority was to promote the “Pact for Security, Justice and Peace”, which sought to reduce the high levels of social violence that plagued the country. He was certain progress could be achieved in that area, especially since in just the past nine months, indicators showed a notable decrease in the number of homicides when compared with last year. “We are moving in the right direction”, he continued, pledging that in the effort to ensure lower levels of violence and higher levels of security in Guatemala, his Government would work with neighbouring countries towards those goals. The third priority area was to implement the “Fiscal and Competitiveness Pact”, which would aim to address fiscal affairs, “one of the weaknesses of our institutional arrangements”. He noted that in the earliest days of his presidency he had successfully promoted fiscal reform, increasing receipts by 15 per cent and allowing the Government to maintain a stable macroeconomic environment by lowering the deficit without reducing public expenditures. More broadly, he said that efforts to fully implement many of the plans and priorities under way in Guatemala were being hampered by the illegal drugs trade. Indeed, at least 40 per cent of the homicides in the country were linked to drug traffic, and the Government was forced to allocate scarce resources to its combat against transnational gangs that trafficked drugs from producing countries in the South to consuming countries in the North. “The existing framework, born out of international conventions of the past five decades, has not achieved the desired results,” he said, explaining consumer markets had expanded, as had the number of producers and types of drugs. The complex issue was clearly one of global concern requiring joint and concerted actions. “We believe that the basic premise of our war against drugs has proved to have serious shortcomings [and] I believe the time has come to accept this fact and adapt our fight against this scourge to take into account new realities,” he said. In Guatemala, young people were the most affected population, and rising consumption among that group required immediate attention. The issue should be addressed for what it was — largely a public health matter rather than a criminal concern. “We must offer treatment, prevention, social protection, economic opportunities and development for the families and communities involved,” he said. Wrapping up his address by turning to global concerns, he said that Guatemala would remain committed to the protection and promotion of human rights. He announced that Guatemala would seek to ratify the Rome Statute of the International Criminal Court. His country would also continue to contribute to the ideals of democracy, justice and peace within a framework of absolute respect for international law. 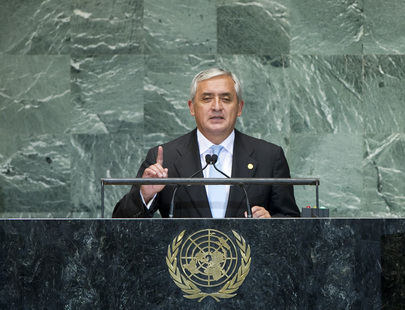 In that regard, Guatemala would continue to carry out its work as a non-permanent member of the Security Council in a responsible manner, and he announced that the country would take over the Council’s rotating presidency in October.